Today was the 2014 Bank of America Chicago Marathon. What does that have to do with me you ask? Well, up until a month a go I planned to run it; up until two months ago, I planned to use it to qualify for Boston. Instead here I am, in Austin, on a two-week (possibly longer) running hiatus. Needless to say, I'm a sad blogger today. It's not just the fact that I lost a chunk of money buying my entry, or the fact that my medal collection didn't grow as expected. What really hit me was seeing photos and posts of my running buddies. I'm not going to lie, I'm pretty jealous of them. I'm jealous of the pre-race jitters they got this past week; of the immense amount of carbs that they had to eat for three days in a row; and of the group run they went on around the windy city on Saturday. I'm jealous of the queasiness some of them felt as they made their way to starting line; or the regret that overcame them as they passed mile 10 and realized they weren't even half way there; or of the annoyance of having to gulp water without trying to splash their faces. But what I'm most jealous about is that feeling of utmost triumph they all (probably) got as they crossed the finish line. ... Anyways. I'll try not to get hung up on it and instead share my dinner from tonight. 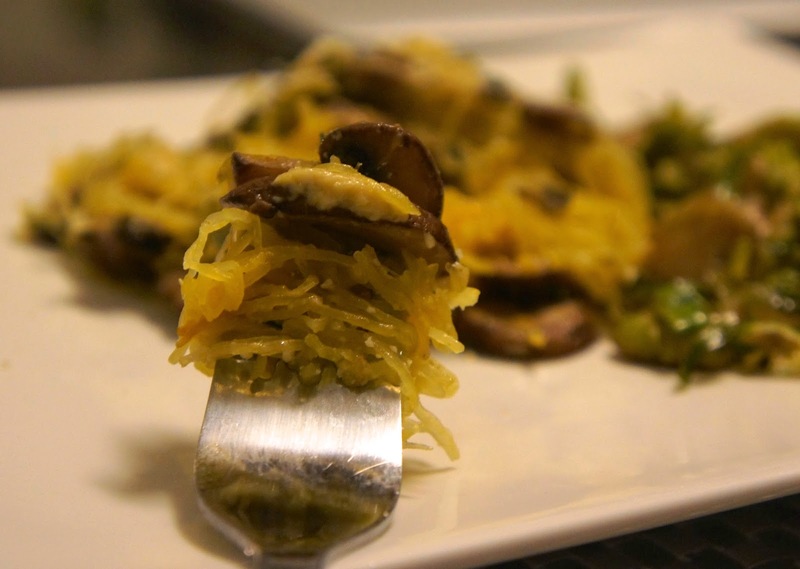 This is the first time I've experimented with spaghetti squash and all I can say is where was this vegetable hiding! 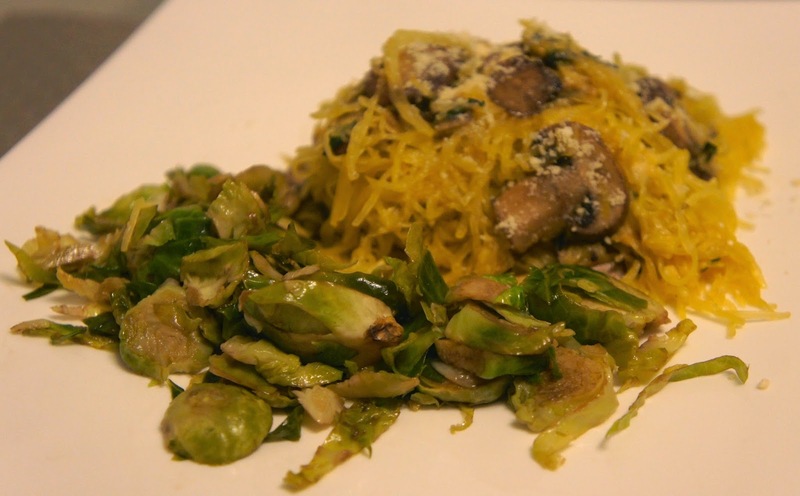 Here's a recipe I found online; it's simple and healthy--did you think I'd post otherwise? But it's also delicious and versatile. Sub in marinara sauce for the mushroom add-on or any other addition you would put on pasta and you've got yourself a meal. Preheat oven to 450F. Line a baking tray with aluminum foil. Using a large knife, split the squash down the middle--I found it easiest to strike once and then keep sticking (with the knife still in the squash) until it was almost sliced through; then I removed the knife and split the squash with my hands. Remove and discard seeds. 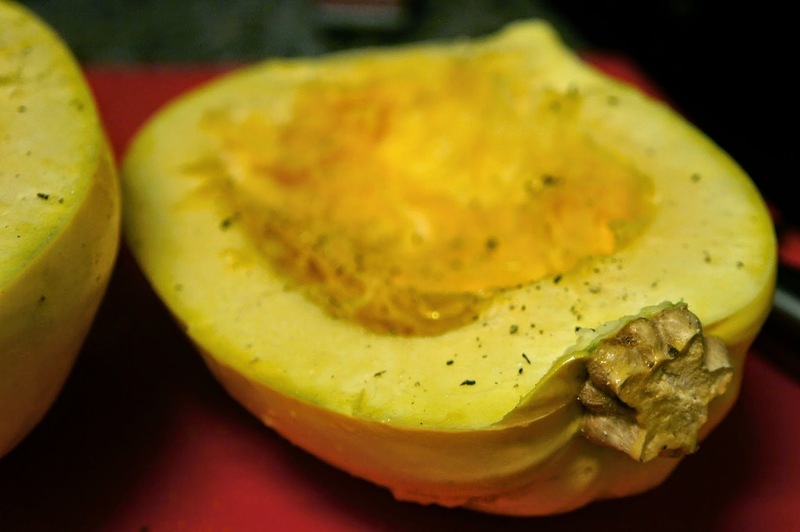 Season squash with 1 tablespoon olive oil, salt, and pepper. Place flesh side down on baking tray and cook for 30-40 minutes, until soft and slightly browned on the bottom. When squash has about 20 minutes left, heat remaining olive oil in a large skillet over medium high heat. 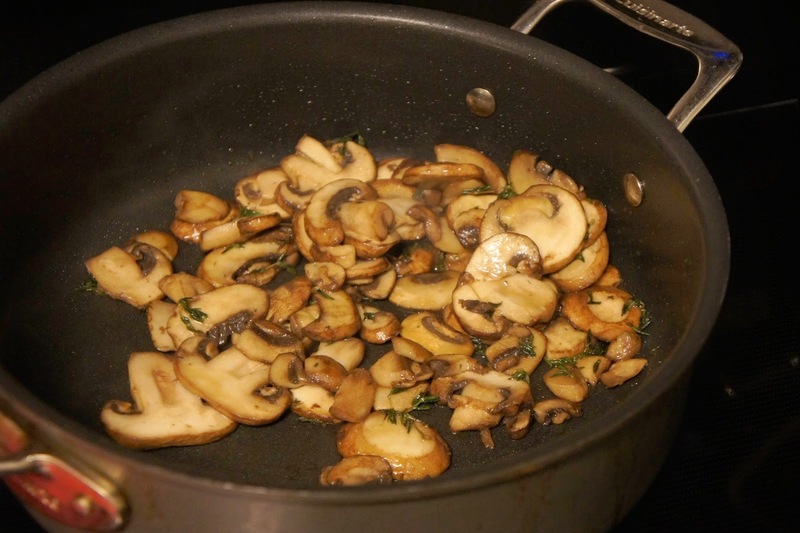 Add thyme and mushrooms and cook, stirring, until mushrooms are browned, about 5 minutes. Remove from heat. Remove squash from oven and set aside until cool enough to handle. 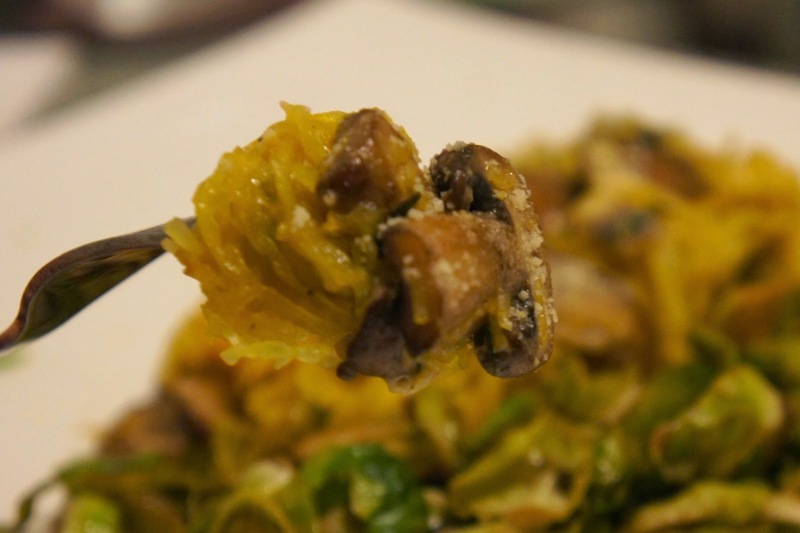 Using a large spoon, scrape the inside of the squash into the skillet with the mushrooms. 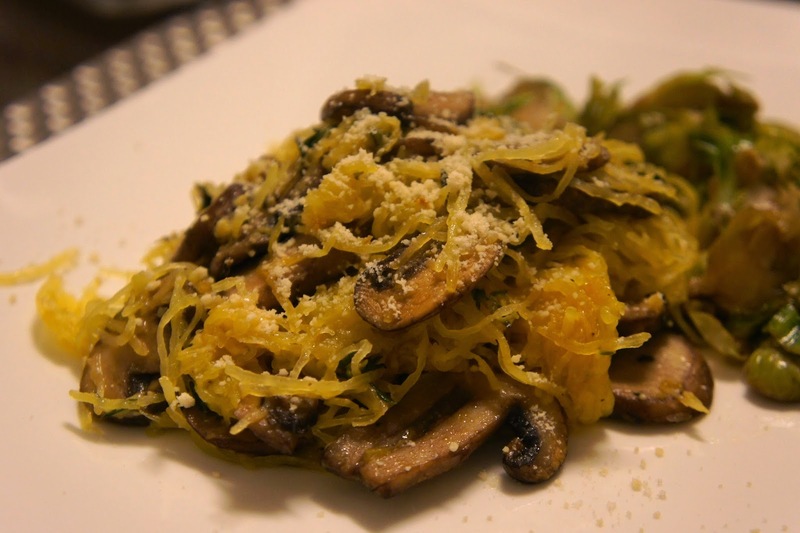 Place over medium-high heat and cook for about 5 minutes, until squash looks golden.